Over the past few years I have been using Don Melton‘s wonderful video transcoding scripts. He recently transformed them into a Ruby Gem. His readme is quite good so I will try not to be redundant. This guide assumes that you have ripped your media using something like MakeMKV. All testing was done on a desktop running Windows 10 Pro using an Intel Core i7-4790K with an external USB BluRay drive. 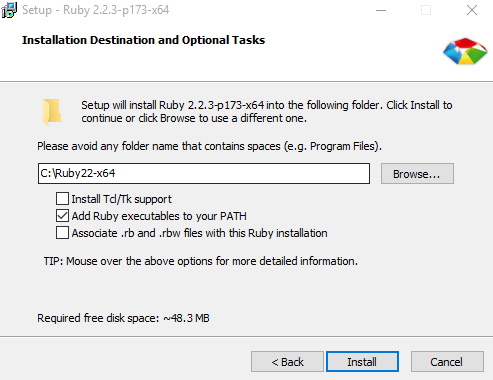 Download RubyInstaller (I used version 2.3.3 64-bit). Choose the option to add it to your PATH during installation. Open Command Prompt and type gem install video_transcoding. If it’s successful you should see something like the screenshot below. Download the latest 64-bit version here. MKVToolNix is a tool set that contains mkvpropedit. Download the portable 64-bit version here. MP4v2 is another tool set that contains mp4track. I had to search a while for a compiled Windows binary and finally found one in this forum post. For reference, the version I downloaded was release 504 32-bit. Copy mp4track.exe and libmp4v2.dll to C:\Ruby23-x64\bin. The only thing I’ll mention is how to use batch files to transcode several files at once. Everything else is covered in the readme. The first line has to be “Echo” followed by any text title. For example, you could use “Echo Movies” or “Echo Encode”. If you don’t add this line Windows will only execute the first command. Start the second line with “call video-transcoding” followed by any arguments you want to use and the full file path of the file you want to transcode. Once your done choose File -> Save As. Change “Save as type” to “All Files”. Name your file and end it with .bat. You can right click that file to “Run as administrator” or edit it. call transcode-video --mp4 --crop detect "D:\BluRays\Breaking Bad s01e01.mkv"
call transcode-video --mp4 --crop detect "D:\BluRays\Breaking Bad s01e02.mkv"
You can shift right click your source files and “Copy as path” to avoid having to type out long directories. By default video_transcoding will dump the transcoded files into the directory it is run from. Alternatively, you can pass a destination folder using –output. It might be worth it to look at the –help output of the gem as there are arguments in there that are not mentioned in the readme. A big thank you to Don Melton for all of the hard work he’s put into his video_transcoding project. He has made transcoding BluRays and getting stellar results drop dead simple allowing me to enjoy my media utilizing Plex, a far better experience than using a BluRay player.